DIY Deck Remodel - Deck Stain & Vinyl Railings Make All the Difference! 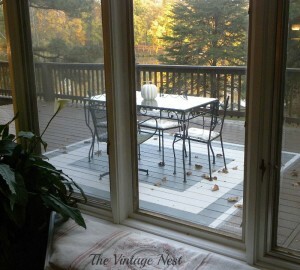 Home » RenoCompare.com Blog » DIY Deck Remodel – Deck Stain & Vinyl Railings Make All the Difference! 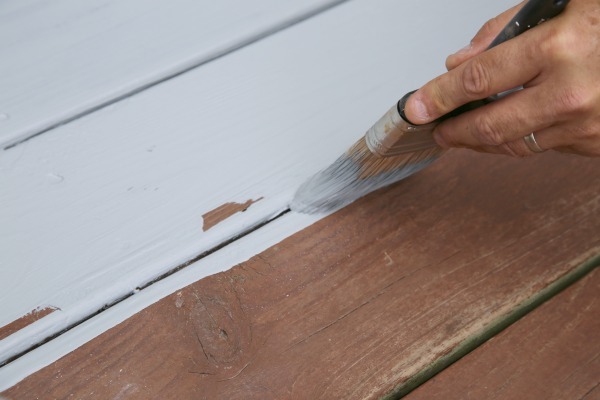 A deck in good repair not only adds to the resale value of a home, it extends living space into the great outdoors and sets the stage for many hours of family activities. View our decks and gazebos page for more inspiration. But what happens when your dream deck has turned into disintegrating money pit, overgrown with foliage and invaded by destructive insects and birds? Kim over at www.sandandsisal.com found herself with exactly this problem. 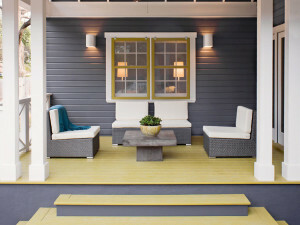 While she and her husband had been busy updating other areas of the home, including their kitchen and family room; much needed outdoor lighting and a front door re-do, their natural wood deck had languished. 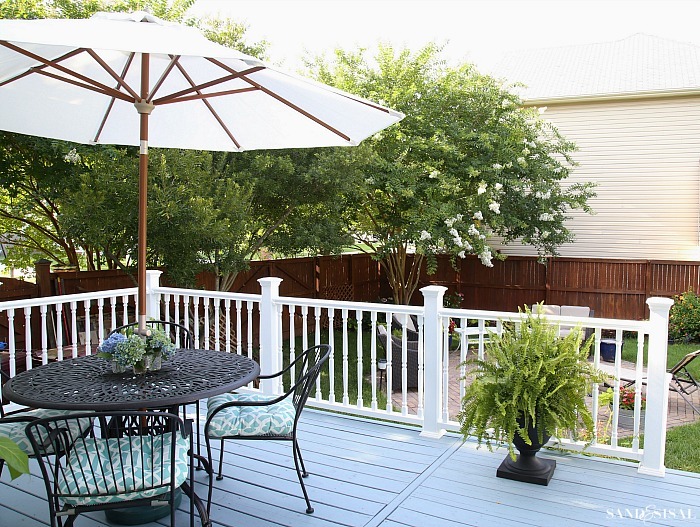 Carolina Jessamine vines had overrun the space obscuring views and impeding the deck’s functionality. The deck railings had become an all-you-can-eat buffet for wood bees and woodpeckers, which was not only unsightly but downright dangerous, what with the structural integrity of the railing being completely compromised by their voracious appetites. There was no hope of saving the deck railing, it had to go. Kim and her husband demolished the railing, but then had to face the question of what to replace it with. Wood construction would soon fall prey to the same wood bees and woodpeckers; leaving the deck railing-free was not an option. With her active family and frequent entertaining that option could create an insurance liability nightmare. Before Kim and her husband could tackle that problem however, it was necessary to decide what to do with the deck itself. They could re-stain and reseal the surface with the original natural color, or they could go in an entirely new direction. After giving the deck a thorough cleaning necessary for any stain application to be successful, Kim struck on the idea of extending the color scheme of the interior of the house out onto the deck, making it more warm and welcoming, a natural extension of the kitchen and family room it bordered. 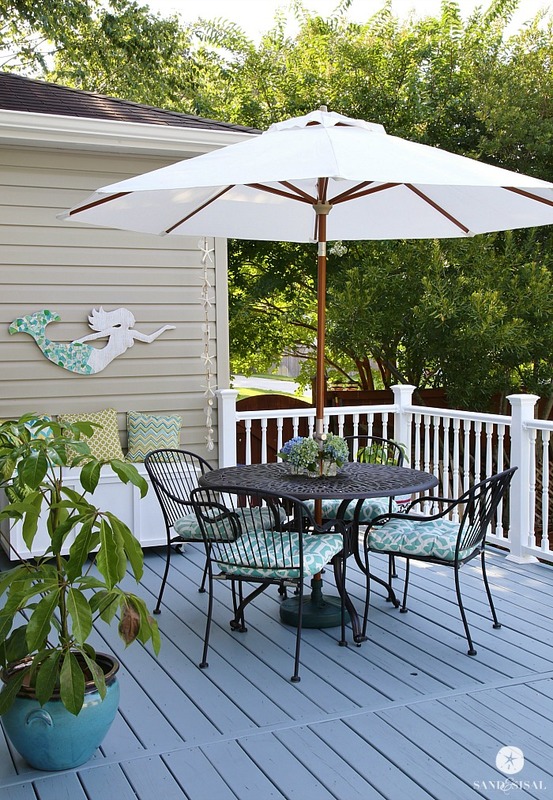 To accomplish this she and her husband chose Solid Color Waterproofing Deck Stain by Behr in Colonial Blue and Bright White. The solid color brightened the deck without creating glare; the colors chosen look gray in sunlight and on overcast days or in the shade, the blue tones become more obvious, a great improvement over the original dark wood stain. Application was accomplished with a roller for the flat surfaces and a four inch wide paint brush for the edges between the deck planks. Resurfacing the deck took two coats of stain, but with Kim and her husband both working on the task, not much time at all. 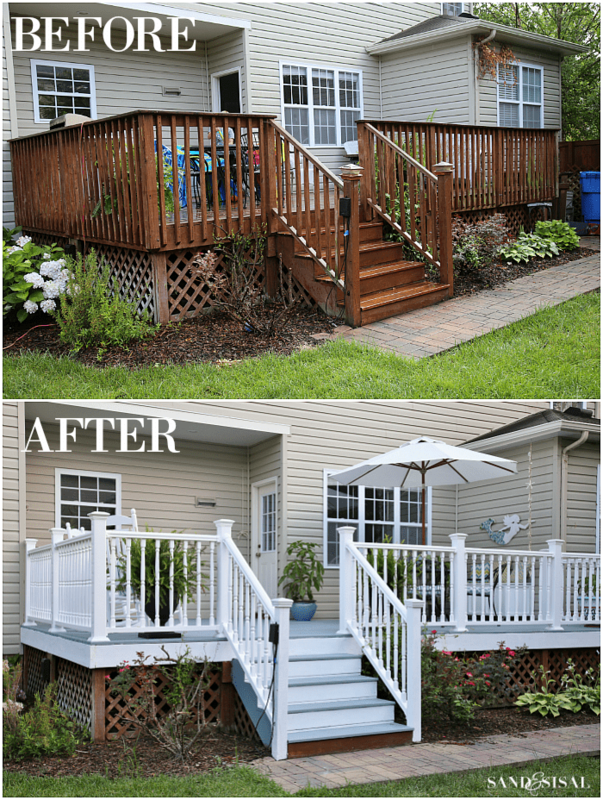 In order to avoid ever having to deal with deteriorating deck railings again, Kim and her hubby found the perfect solution in vinyl railing available from their local Home Depot store. Self-installation was a snap, and the couple was thrilled with the sturdiness and strength of the new system. No more worries about woodpeckers and wood bees! The white vinyl they chose once again brightens up the area and makes it more welcoming and homey, as well as adding a touch of elegance that the original wood railing could never have managed.